Northwestern will not bargain with the Service Employees International Union, a workers union which non-tenured University faculty recently voted to join, because of contested ballots that were not counted in the vote, according to a letter to such faculty. 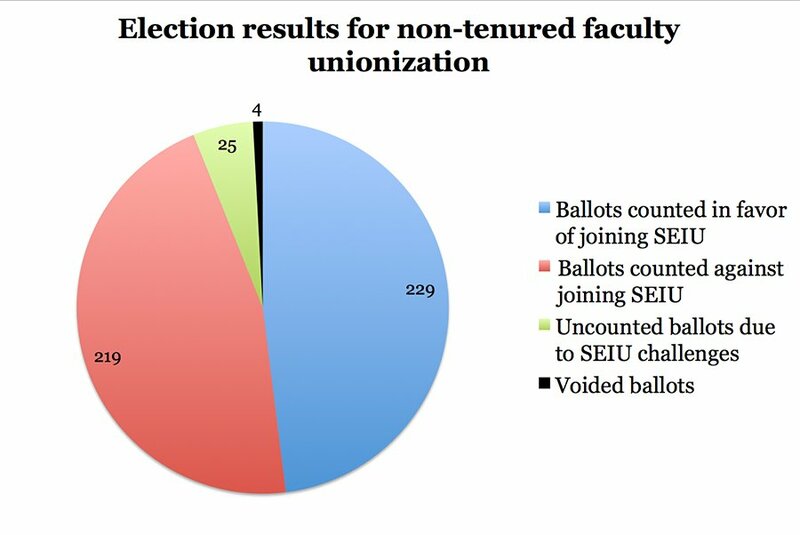 As of early May, 229 votes by non-tenured NU faculty had been counted in favor of joining the SEIU and 219 votes had been counted in opposition, according to a National Labor Relations Board document obtained by The Daily on Friday. An additional 25 ballots were not counted because they were challenged by the SEIU and the individuals who cast them were “found to be ineligible” by Chicago NLRB regional director Peter Sung Ohr, according to the document. Since the challenged ballots were considered ineligible and the counted ballots showed a majority of voters in favor of unionization, the NLRB certified the SEIU as a valid representative of the non-tenured faculty on May 26. Northwestern administrators, however, disagree about the status of the 25 voters deemed ineligible by the NLRB and have appealed the decision to the NLRB, University spokesman Al Cubbage said. The appeal is still pending. Jeffrey Howard, chief of staff at SEIU Local 73 — a Chicago-based SEIU branch that would represent the NU employees — said Friday, in a statement sent through a spokesman, that NU “is at risk of committing an Unfair Labor Practice” by failing to comply with the NLRB’s decision to grant bargaining rights to the SEIU. The original unionization election took place in June 2016, but the results were delayed by a series of ballot challenges by both the SEIU and NU, many of which were later overruled. In August 2016, before any challenged ballots were counted, the vote stood at a more decisive 223-191 in favor of unionization, according to the May NLRB document.